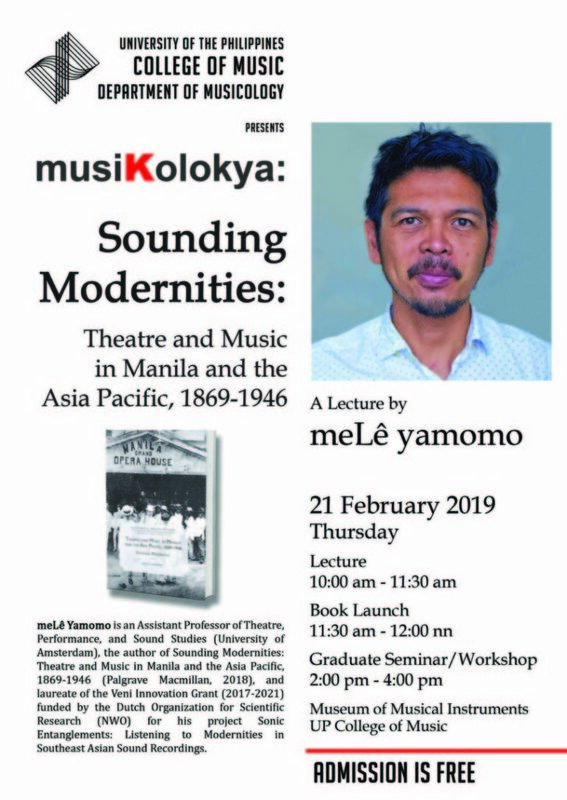 I will be doing a Philippine launch of my book »Sounding Modernities: Theatre and Music in Manila and the Asia Pacific, 1869-1946« on 21 February at the University of the Philippines Diliman-College of Music! As part of the Musikolokya, I will also give a lecture on the nineteenth-century theatre and musical practices in Manila and the Asia Pacific. After the talk, I will be joining Prof. Jose Buenconsejo in a PhD colloquium at the UP Museum of Musical Instruments. Many thanks to Prof. Patricia Brillantes Silvestre and the Dept. of Musicology for making this event possible.